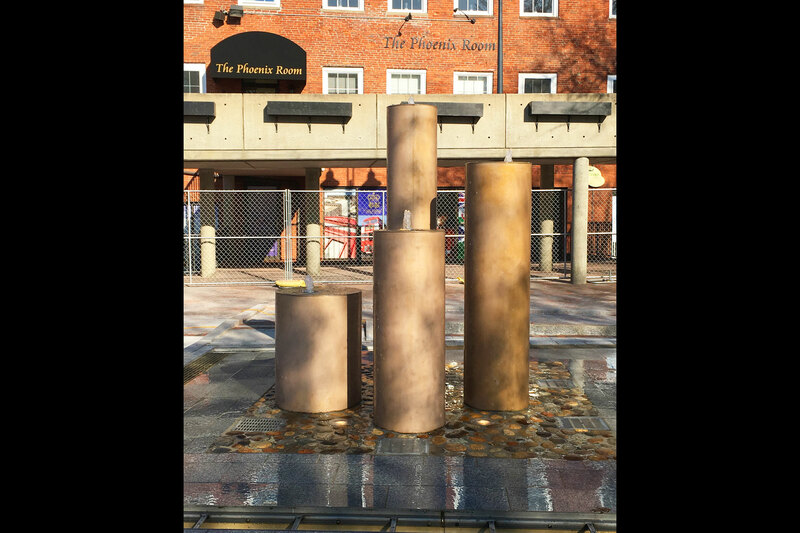 Delta Fountains helped renovated the historic fountain at Inn Street. The Inn Street fountain is a Massachusetts historic resource. 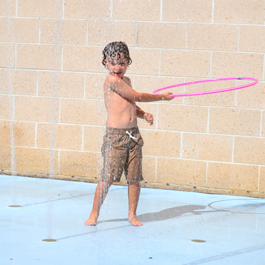 After being out of operation for several years, the Newburyport community voted to rehabilitate the existing feature, add lighting and add an interactive splash pad. New signs were also added to explain the significance of the fountain’s references to the central waterfront and the town’s maritime history. 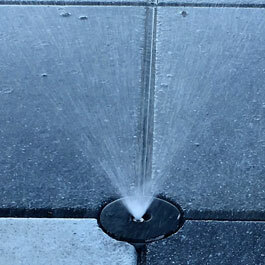 Today, the fountain’s inner cylindrical columns sit inside a rock-paved splash area. Six pop-jets spring out of the rocky boarder to encourage more interaction with the historic piece, while columns inside the splash pad spray water from above. Delta Fountains mechanically redesigned, specified and provided the equipment for the Inn Street’s historic rehabilitation. 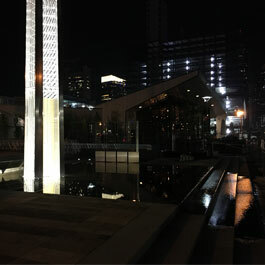 The three main challenges that we faced were the City’s requirements for filtration within the designated plaza area available; the integration of lights and water nozzles into the existing brass faceplates of the columns; and the need for remote monitoring and operations. 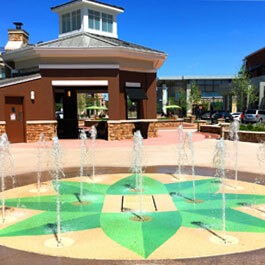 To alleviate the City’s concerns about water use and quality, and to comply with the need to keep all filtration equipment within the parameters of the designated plaza area, our team designed a new fountain pump and filtration system that included a full-treatment, self-contained Dechlorination Tank. The Dechlorination Tank is used to keep any chemically treated water from entering the storm sewer system by using a gravity-feed type dechlorination system. Within the tank, all of the components involved are aligned in an order that would allow gravity to do its job until it reached a pre-existing storm sewer pipe. In order to verify that the tank had the proper elevation change to allow the gravity erosion process to function naturally, our field team had to work their way backwards from the inverts of the existing sewer pipe. In an effort to preserve the original structures, we were sent the faceplates to design a light and nozzle feature that could attach to the bottom of each faceplate, to be hidden within the columns. We then designed a new nozzle insert for the White LED Ring Light with the ability to second as a faceting device, effectively attaching the faceplate to the light by screwing one into the other and sandwiching the bronze plate. The original faceplates were custom water-jet cut out to match the pattern of the lights and nozzles. This project used an EWON Communication System for remote monitoring and operations, which allows as many as four users at a time to access not only the main screens on the HMI, but also every menu screen on the ORP/pH controller. Users can log in from a computer, Ipad, or cell phone in order to connect to the fountain’s controllers. All remote users have full functionality of every touch screen button available as if they were standing in front of either controller.